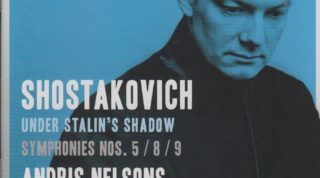 Following up on Latvian conductor Andris Nelsons’ Grammy Award winning first album of Dmitri Shostakovich’s symphonic music performed by the Boston Symphony Orchestra – Shostakovich: Under Stalin’s Shadow – Symphony No. 10, the next volume in the series has been released – this time featuring Shostakovich’s symphonies 5, 8 and 9 (Deutsche Grammophon DG 479 5201). The two CD set also includes the suite from the Incidental Music to “Hamlet”. All the works were recorded live at Symphony Hall in Boston. The next release in the series is planned for 2017 and will contain Shostakovich’s symphonies 6 and 7. The goal is to record a complete cycle of Shostakovich 15 symphonies as well as the opera Lady Macbeth of Mtsensk. According to Andris Nelsons’ website, he has signed an exclusive recording deal with Deutsche Grammophon, and his many forthcoming recording projects include a full Beethoven symphonic cycle, as well as Bruckner’s symphonies. Nelsons would not be the first Latvian conductor to accomplish this feat – Mariss Jansons also recorded all of Shostakovich’s symphonies (though with different orchestras), and also won a Grammy Award for his performance of Shostakovich’s Symphony No. 13 with the Bavarian Radio Orchestra in 2006. For further information, please visit Andris Nelsons’ website.